When you need to repair a crack in your foundation and don’t want to dig up the foundation wall, you should know that there are two ways to fix cracks from the inside: epoxy injection and polyurethane injection. Among waterproofing contractors within the Greater Toronto Area, and on many websites worldwide, there are differing opinions as to the best method to use for foundation crack repairs: epoxy crack injection or polyurethane crack injection? In an attempt to put an end to this controversy, this page was written by one of our very experienced injection technicians with the mandate of providing an objective and unbiased comprehensive comparison of the characteristics of each type of crack injection, detailing their advantages and disadvantages. Is Epoxy or Polyurethane Better? Epoxy and polyurethane are referred to as resins; for the most part, both are two component formulations. The blending of the 2 components for each resin type creates a material with the requisite properties for professional crack injection repairs. In the case of epoxy, one component is the epoxy resin and the second is a hardener; both are blended together immediately before a crack injection. The mix ratio is typically 2 parts epoxy to 1 part hardener. Most injection epoxies fully cure within 3-4 hours at a temperature of 77° Fahrenheit or 25° Celsius; although some faster curing epoxies have recently been introduced. Epoxy is comparable to glue; once cured, it has a strong bond and a hard plastic-like texture. Polyurethane (or urethane), used for foundation crack repair applications, while not necessarily a 2 component blend, can have 2 components; the polyurethane resin and an activator, or accelerator. Like epoxy, the 2 components are mixed before they are injected into a foundation crack. Unlike epoxy, the texture of cured polyurethane can vary significantly as there are many different polyurethane formulations in use. Like epoxy, polyurethanes have varying viscosities (thickness of the fluid) depending on the formulation used. Some cured polyurethane formulations become very rigid, some are powdery, others are rubbery, etc. The polyurethane formulations vary among manufacturers so one cannot generalize regarding the properties of cured polyurethane. To accommodate crack tension and compression we believe that polyurethane should cure with a rubber-like consistency. The cure time associated with polyurethane does vary, even among crack injections using the same formulation. The initial cure time for polyurethanes is generally 15 – 45 minutes and is influenced by both temperature and moisture. There can be significant differences in how polyurethane crack injections and epoxy crack injections for wall crack repair are carried out. Epoxy crack injections are referred to as “surface port” or “low pressure” injections because they involve the use surface mounted injection ports to direct the epoxy into a crack. These injections are done at a relatively low pressure (20-40 psi). Polyurethane injection can also be done at low pressure, exactly like an epoxy injection, or at high pressure (typically 1500 – 3200 psi). 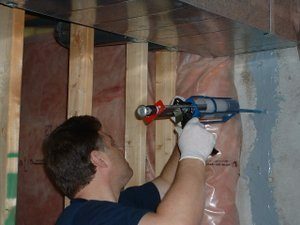 The high pressure injection of activated polyurethane uses an electric injection pump and packers hammered into drilled holes through the crack in a poured concrete foundation wall. Like epoxy, the injected polyurethane fills the crack through the entire thickness of the foundation wall (typically 8″) thereby preventing water from entering the crack. There are times when a polyurethane crack injection includes a flushing process to clean out the crack; thus ensuring excellent adhesion of the polyurethane to both sides of the crack. The epoxy crack injection process does not involve a flushing process. Click here for more detail on how a polyurethane injection is performed. 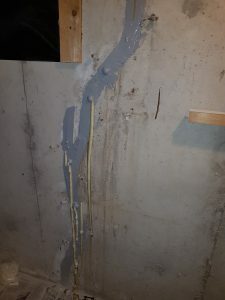 The tensile strength of cured epoxy is typically 7000 psi whereas the tensile strength of concrete is in the range of 300 – 700 psi; clearly, the bond strength of epoxy is much greater than that of the foundation wall; making epoxy a good choice for foundation wall structural crack repair. When tension is applied to a crack due to thermal cycling or the retraction of the soil against the exterior of the foundation wall, the cured epoxy crack repair will not yield. In most cases, an epoxy crack injection will also not yield to crack tension attributable to excessive loading of the foundation. This excessive loading generally is found where steel I-beams are located. When a crack is under tension it opens up; therefore, a material that cannot withstand the tension will tear. Epoxy is the best material to use when a crack is under tension; however, a reinforced polyurethane crack injection will work just as well. The low pressure injection method used for an epoxy injection provides visual confirmation to the injection technician that the crack has been completely filled. The curing time allows the epoxy to gravity feed within the crack, thereby filling all parts of even the finest cracks. Epoxies can be obtained in various viscosities to suit very fine to very wide cracks. It is also possible to obtain very low viscosities for epoxy on-the-job in order to properly fill very fine hairline cracks. Arguably its most significant advantage, polyurethane can be used regardless of the condition of the crack and the weather. It doesn’t matter if the crack is actively leaking, full of mud and/or mineral deposits, or if it is fine or wide. Polyurethane injection can involve a crack flushing process to clean out the crack prior to injection. The chemical expansion of the polyurethane (typically 5-10 times its original volume) makes polyurethane very effective at filling voids within the concrete; these voids are typically invisible when you look at the wall and are often associated with the porosity of the concrete. Occasionally, high injection pressures are required to fill cracks that are very fine and/or when concrete is completely saturated with water and therefore weak. Using electric pumps, it is possible to obtain injection pressures up to 3200 psi. The rapid curing of polyurethane is beneficial when a leaking crack is flooding the basement; this is an important attribute when waterstopping is urgently needed. Like the epoxy crack injection, the low pressure polyurethane crack injection provides the injection technician with positive confirmation that the crack has been filled completely. Because water accelerates the curing process for polyurethane, the effectiveness of a polyurethane crack injection can be confirmed while the injection is in progress. This is accomplished by flooding the wall during the injection, thus providing confirmation that the repaired crack no longer leaks. Since an epoxy injection is a surface port injection, the injection ports must adhere to the wall surface, directly over the crack, with a very strong bond. Moisture adversely affects the adhesive qualities of the anchoring epoxy used to adhere the injection ports onto the crack. Without sufficient bond strength, the anchoring epoxy will not withstand the pressure of the injection. If a crack is actively leaking or if the surface of the wall is damp or wet, the paste will not adhere well to the crack surface and therefore, an epoxy crack injection cannot be done reliably. If the inside surfaces of a foundation crack are wet the epoxy will not adhere to the concrete. Epoxy crack injection is not suitable for the re-injection of previously injected crack repairs that have failed. When an injection has failed, it is logical to assume that there is residual injection material within the crack; this being the case, injected epoxy may not travel along the full length of the crack due to obstructions. In this situation, it is adviseable to use an injection material with expansive properties (polyurethane); this will ensure that whatever voids remain in the crack, responsible for the ongoing leaking of the crack, will be filled. Quite often, homeowners attempt to repair basement leaks by using hydraulic cement or caulking; these repairs typically fail. In such instances, epoxy injections are inappropriate for several reasons: there is no longer clear surface access to the crack, mud and/or mineral has likely built-up in the crack and the concrete around parts of the crack is often damaged due to saturation that resulted from water trapped in the crack. While the curing time and the available viscosities of epoxy are viewed as positive attributes of this type of injection, they can also be viewed as weaknesses. Epoxy crack injection relies on the containment of epoxy within a crack until the epoxy has cured – a process that typically takes several hours. This containment relies upon the compacted soil against the outside wall. Poorly compacted soil, the presence of air-gap damp-proofing membranes and the use of epoxies of excessively low viscosity are conditions that will result in the bleeding of epoxy into the soil. If most of the epoxy bleeds into the soil while the epoxy is curing, the injection will likely fail because the crack hasn’t been completely filled. This is the reason that faster curing epoxies have been created. The inflexibility of epoxy is often cited as a negative attribute of epoxy crack injections. While it is true that epoxy is inflexible, one must keep in mind that the entire poured concrete foundation is rigid; therefore, the need for flexibility in the material used to inject a crack, in our opinion, is illogical as there is really no need accommodate crack movement. In residential construction, allowances for cracking are only required by the Building Code when walls exceed 25 meters in length. While polyurethane is flexible and can absorb compressive force it does not do well when exposed to significant tension; consequently, it is possible that polyurethane will tear if there is excessive tension within the crack, unless it is reinforced. Fortunately, it is possible to install carbon fiber reinforcing staples to ensure that a crack cannot widen. OK, so which method is best for repairing cracks in concrete: epoxy or polyurethane? Since an epoxy crack injection is a structural repair which prevents basement leaks at the same time, it is logical to conclude that epoxy should be used as much as possible. From a “effectiveness” point of view, the characteristics of the crack to be repaired should dictate which injection method to choose. For example, if a crack requires a structural repair we would use epoxy if all of the conditions that are required for this injection are met. If not, a polyurethane injection would be a better choice. If reinforcement is required, we would perform an epoxy injection or use staples to stablize a crack in order to compensate for polyurethane’s inability to withstand tensile forces. Similarly, if a crack is full of mud, we would elect to inject the crack with polyurethane to take advantage of the crack flushing process associated with this injection method. Ultimately, the characteristics of the crack to be repaired should dictate the most suitable injection method. 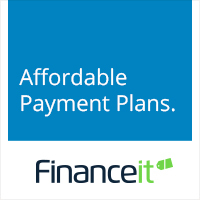 Clearly, it is wise to hire a company that offers both types of crack injection and that has skilled technicians with plenty of experience.